Nice work, i'm tempted to do something like this in the near future. @callam3n - i've still got a motor and panel with switch for the electric sunroof knocking around. Hmmm will have to have a look at them, I think they are from the later one, bought from our happy friend Audibits. I have just checked and a motor from a B3 saloon will also fit, don't know if that helps. I'm not too sure about the cover, it would at least be the wrong colour even if it did fit. You need to avoid parts from a coupe or avant as they will certainly not work. Absolutely brilliant - well done! I'm swapping the interiors of my two cars shortly which will mean taking out the dash anyway. This would obviously be a very good time to do this kind of thing! Temperature gauge - For it's size this involved a lot of wiring, you need switched live, earth, vehicle speed signal, dash illumination and temperature signal. You also have to run a wire to under the left headlight for the temperature sender. It wasn't difficult to fit just took some time to find all the wires. Headlamp washer - these are easy as the plug for them is already under the dash, you just need to run a wire from that to the front bumper. you will also need the relay for them. Aux gauges - I found these would be easy to fit if you didn't want to keep all the wiring as it would have been from the factory but as I did I had to run a couple of wires from the fusebox. The wires from the senders are already there, I can't remember exactly what other wires you need to install but I can find out. You will need the oil pressure sender but the temperature one is already in place you will also need both sections of the centre console. I've got the concentration span of a noob! I've saved this thread to re-look soon. Good bits good so far! Eventually a news/ thread for the home page? Can you fit the onboard computer to an ordinary dash, or do you have to get a new one? Also, do you have to fit the Autocheck when fitting the onboard computer module, or will things work OK without it? You just replace the centre part of the dash, you keep the speedo etc. You can get an on board computer with minicheck or autocheck. On board computers with autocheck are not easy to find for the V6. On board computers with minicheck are more common and there is a jumper in them so you can change them to suite any model. I would only fit an autocheck one if you want to fit the rest of the autocheck stuff, I can't see the point otherwise. I will reply to your pm but I'm a bit busy at the moment and it will take me a while to get all the information together for you. Thanks - no worries about the pm, I'm busy too at the mo. so I'm not in a hurry on it! Actually it's quite a relief that I'll only have to do the minicheck version. Presumably this is a little easier to wire in, also? There is almost no new wiring needed for the computer as most of the connections are made by the existing pins on the back of the instrument cluster. You just have to extend the fuel consumption signal wire and fit 4 wires from the computer to the stalk. If you want to fully fit autocheck like I have it will involve quite a bit of work, it must have taken me 10 hours to fit and you have to get all the parts and work out how it all goes together before you can even start. I fitted it because I liked the idea of knowing when bulbs have gone and the dot matrix display looks nicer than the warning lights. i've seen this: http://tinyurl.com/yoxc97 and have thought it would be fitted to my b4 2.6. That is just a standard minicheck unit that all B4s would be fitted with as standard. The only reason you would need to modify the wiring is if you have autocheck and you want to downgrade to minicheck but I can't imagine that being the case. Are you sure it isn't the on-board computer (which gives you your fuel economy etc) or autocheck (tells you if bulbs have blown or washer fluid low etc) you are looking to fit? If you really do want a minicheck unit I might have one you can have for free, as far as I'm aware they are quite worthless and in plentiful supply. my b4 avant doesnt have it i dont think? its not on the drive at the moment so i cant check?! what does this 'minicheck' system do then? mfa computer for mpg etc is easy ti fit as its a unit that plugs in and under the pedals is a yellow plug thats it,that then plugs into the dials. Minicheck is just 3 warning lights for oil pressure, brake fluid level/hydraulic pressure and coolant temperature/level. I think http://www.s2forum.com/forum/showthread.php?t=9762 should cover fitting a trip computer. You need to be aware that you can get a trip computer with autocheck or minicheck. I would advise that you stick to whatever you already have as fitting autocheck to a minicheck car is a lot of work and doing the opposite is pointless. There is also a really useful PDF on fitting a trip computer with minicheck, it is all in German but has really good pictures, I will see if I can find a link. A lot of nice work gone into that. Nice. my v6 avant doesnt appear to have minicheck!!?? funny as its fairly high-ish spec? A80QAAH i know your busy so please dont feel obligated/pressured, however i'd be very interested in covering any costs associated with sending over that minicheck unit + beer money for you if you would wish to send it on? i'd also be well interested in the german pdf you have on fitting the computer! Minicheck with trip computer: Same 3 warning lights as before but has an LCD display which gives mpg and tank range etc. The speaker is still present but hidden from view. It has a 14 pin socket on the back. The top 2 units in the picture below show what this looks like. Autocheck: Single LCD dot matrix display, you can tell it apart from the minicheck unit as it has a smaller screen set at a slight angle and a 26 pin plug on the back, it does not a does not have a speaker grille as this function is moved to a waning buzzer in the aux relay carrier. It is shown in the bottom left of the picture below. Autocheck with trip computer: Same as above but with trip computer function. Shown in the bottom right of the picture below and there is also a picture of this type of unit working in my first post of this topic. Here is a link to the PDF for fitting minicheck with trip computer. http://www.meckisfaq.de/bilder/pdf/bc.pdf I would have thought this what you were looking to fit rather than just a minicheck unit. It took me 6 months to find one of these units and then I found 2 within a week. I only used it for a couple of days before deciding to fit autocheck so now I have 2 of them that I spent a lot of money on doing nothing. It would be really helpful if you could find out what your car is fitted with now. I really do expect it to be minicheck like the unit you were looking to buy as that is what was fitted as standard to all B4 Audis, any of the other units a quite rare to come across. yes, i do have minicheck, i got my wires crossed after having the 90 with what i now know as autocheck, silly me. so, knowing i now have minicheck, and not needing just a regular minicheck unit, i'll keep my eyes open for a minicheck + computer, i'm not sure whether you would be interested in selling on your old one? or is autocheck the preferred solution? years ago, when i had a calibra, i fitted a fuel computer to that, but sent it off for programming to suit my engine, is it the same with these? could i use one off of say an S2? cheers and again, thanks in advance. If you get a minicheck unit with a trip computer it can be adapted to work in any car just by soldering on a jumper as shown in one of the pictures in that PDF. With autocheck you have to get the correct one for your engine if you want the oil pressure warnings to be correct. It is quite possible to fit autocheck as I have shown, but it is a lot of work if you want all the functions to work. 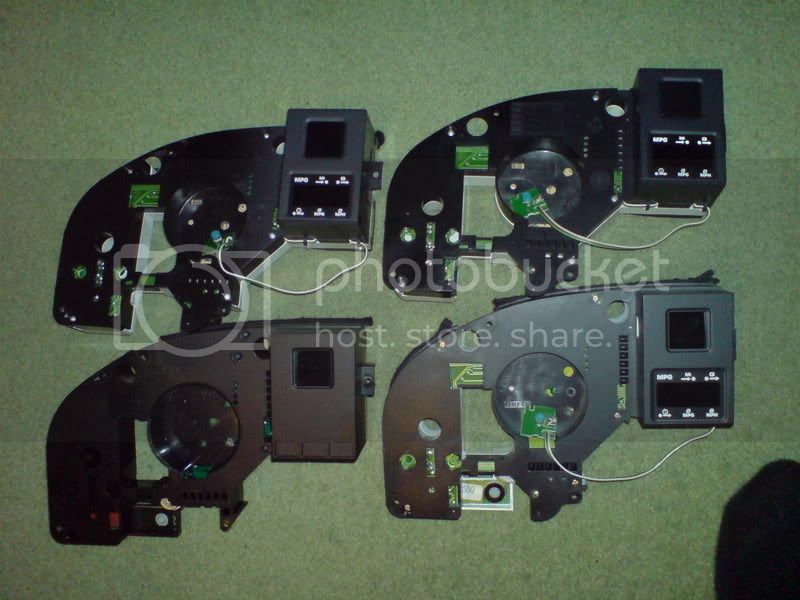 With the exception of the autocheck unit with trip computer the parts needed are quite cheap to buy from breakers. Even if you don't wire up all the functions of the autocheck (which would make fitting it pointless in my opinion) you still have to wire up the warning buzzer which is quite a lot of work as you have to change the routing of about 5 wires. If you want to wire up all the functions you will have to run 3 wires to the back of the car which would mean taking out quite a bit of the interior and then you have to change all the wiring for the rear lights. You also have to run a wire to the washer bottle and change the pump as well as changing the wiring for the headlamps. I am not saying it isn't possible, the wiring involved isn't all that difficult if you understand what you are doing although it is a bit fiddly and I would not like to have attempted it with the dash in place. The trip computer is quite easy to wire up as shown by that PDF, I made my own loom up as I couldn't find the one I needed but if you do find one fitting it would be really very simple. It took me 6 months to find one of these units and then I found 2 within a week. I only used it for a couple of days before deciding to fit autocheck so now I have 2 of them that I spent a lot of money on doing nothing. Have you by chance still got one of those minicheck/comp units Matt? I do still have one left, it's a a V6 BC with minicheck but you just have to solder on a jumper to use it on a diesel. I was going to keep it as a spare but as I've sold the car i'm willing to sell it. I'm not quite sure how much to ask so make me an offer. Very nice. Looks decidedly scarey with the fascia stripped out. If I'd wired it - the wipers would come on when I switched on the lights! Thanks very much Matt, I've PM'ed you. From what I can make out of the PDF, the diesel version requires all the jumpers to be removed. That sound right to you mate? I've ripped a copy of the picture from the PDF. Edited in an attempt to restore pictures, didn't mean to reply!